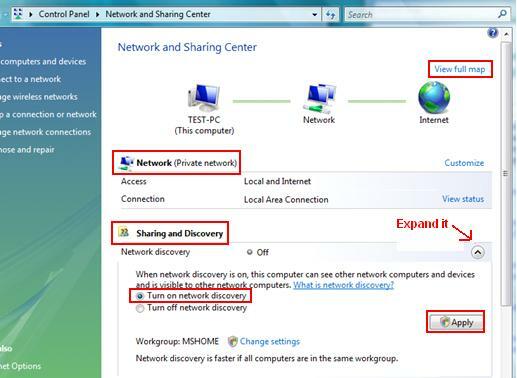 Network Discovery is new feature in Windows Vista and if you enable this feature, your Vista computers can see and discover other computers, other computers will be able to see this Vista computer as well. After enabling this feature, the discovered network devices will be displayed in Network Map. I like this feature because it visualizes how my network devices connected to each other. 2) Network and Sharing Center window will appear, expand the Sharing and Discovery section and click Turn on network discovery, then click Apply. After that click View full map to see all connected network devices. Note: Windows cannot create the network map if you set the network location type to Public. The network map can only be viewed if you set its network location type as Private. Note: You can still create a network map in Public network, but you need to change some settings in order to make it works. Check out how to create Network Map in Public network or Domain joined network here. Local Area Connection – Select this option if this Vista computer is connected to network using network cable. In this case, Vista computer (test-pc) is connected to home network using straight network cable. Note: If your gateway/router is having switch feature built-in, the network map will display the switch as additional device. Note: If you click on those computers, the computer will show you the shared folder/pinter. Wireless Network Connection – Select this option if this Vista computer is connected to home network wirelessly. In this case, Vista computer (test-pc) is connected to network wirelessly. Changing the Network Location Type in Windows Vista. Return to top of "Enabling Network Discovery in Windows Vista"! !